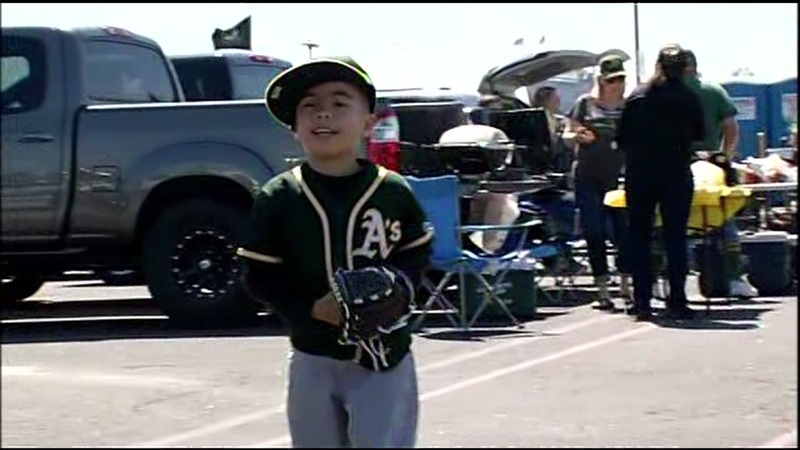 OAKLAND, Calif. (KGO) -- It's Opening Day in the Bay! The San Francisco Giants won their game earlier, hammering the Milwaukee Brewers. On Monday night, the Athletics face the Chicago White Sox in Oakland. To the relief of A's fans, the Oakland team did not change their venue this year. Though, the name is in flux. Even though the signs still say O.co Coliseum, Overstock.com did not pick up its $1350,000 option, leaving management in a sales frame of mind to find a new sponsor. "This is a real bargain and an opportunity," said Oakland Coliseum Executive Director Scott McKibben. Preparations at the Coliseum started bright and early on Monday. The grass was trimmed, crews tidied up, and the A's mascot Stomper was eager to meet fans later in the day. It's all part of the anticipation to kick off the baseball season. "Everybody is excited about Opening Day, it's almost the unofficial American holiday," said Troy Smith, A's Senior Director of Marketing. Of course, the Athletics haven't been sitting idle. They were recently at Spring Training, practicing with a few new players on the roster. "We improved the bullpen, we have a strong stating rotation with power hitters, so I think the fans are going to be pretty excited to see the new guys come out here and perform," said Smith. Ahead of the home opener, fans showed up to tailgate in the parking lot. Fan Joe Gonzalez was busy cooking, while fellow fan David Reyes played catch with his son, brother, and father. Reyes says he's been coming to games since he was 2 years old. That's three generations with memories of this day in this place, no matter what you call it. "It's still the Oakland Coliseum, and that's home," said Reyes. Fans will also have a chance to buy one-of-a-kind souvenirs. "Pretty much anything that comes up off the field they'll be able to purchase," said Erik Farrell, authentication manager. "Game use bases from tonight's game and the baseballs, those are going to be unique because they're branded with the Opening Day logo from MLB on it." Sonny Gray was set to start for the A's for the third straight year. He would have become the only pitcher in the team's history to do so. However, early Monday afternoon we learned that he was scratched from the lineup due to food poisoning. Rich Hill will now start for the A's. Wow. Bad news for #Athletics. Sonny Gray scratched due to food poisoning. Rich Hill will be opening day starter. Rich Hill will be the #Athletics 10th different Opening Day starting pitcher in the last 11 years. As for the Giants, their home opener is Thursday against the Dodgers. Click here for full coverage on the A's.